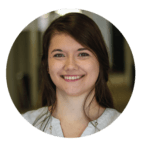 Katie Vaughn started as a Health Advisor with Pack Health in April of 2018. Working with members over the past year, she’s picked up on patterns in how office activities, resources, and culture affect individuals’ physical and mental health. Her interest in these issues led to her recent transition into the HR Coordinator position, where she strives to create a positive, healthy work environment for the Pack Health Team – and inspired her to write this insightful piece! Read on to learn more about the factors that shape employees’ mental health and wellbeing. In the United States, approximately one in five adults experiences mental illness each year. Mental health issues are a leading contributor to absenteeism in the workplace and are known to exacerbate chronic conditions such as hypertension, high blood pressure and cardiovascular disease. 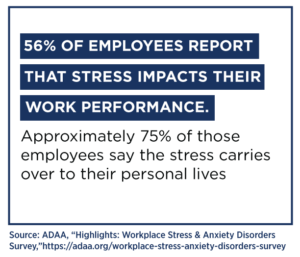 A survey done by the ADAA has shown that 56% of people report that stress impacts their workplace performance, and 72% of women (80% for men) report that their workplace stress impacts their time off¹. The higher your risk of stress, the higher your risk of experiencing a mental health issue². The research on this topic is clear, but how do we act on it? What do members need to improve their mental health and how do their work environments fit into that puzzle? Today, I want to take a moment to examine how the experiences I’ve had working with Pack Health members have informed my understanding of what makes workplace wellness work. I will also share a few stories to help Human Resources teams better support employees’ mental health and productivity. One of our members, Mrs. E, used to run several miles each day, but her job placed a very heavy workload on her plate. She was spending nine hours of her day at work and another nine hours of her time at home just trying to catch up. Very quickly, she realized her work commitments had caused her to lose sleep, cut out her physical and social activities and eat much more take out, due to a lack of time to cook and grocery shop. This member realized she couldn’t sustain this lifestyle and made the decision to leave for another job that better fits her schedule. If Mrs. E had more flexible hours, and a more realistic work schedule, she likely would have continued to maintain her level of fitness instead of experiencing burn out. Comparatively, Mrs. B works two jobs and reports regular positive impacts on her mental health from both workplaces. She has significantly increased her exercise and is up to two miles a day Additionally, she has shifted to an anti-inflammatory diet and has even encouraged her daughter to make healthy changes of her own. She has also played an active role in her own health by being able to make regularly scheduled check-ins with her primary care physician. Both members work and upwards of 50-60 hours per week, but report the opposite outcomes. What does Mrs. B have that Mrs. E doesn’t? Mrs. B’s first job provides her with resources, such as Pack Health, and wellness screenings. Then, through her second job, she’s been able to find a social support network of men and women with the same chronic conditions. I hear stories regularly about their group exercise routines and commitment to self-care. Mrs. B works for a smaller workplace, with limited resources, but she’s very in tune with which resources she can best utilize to fit her needs. In contrast, Mrs. E, who works for a much larger company actually has access to similar resources, but the visibility isn’t the same. She has access to a gym at work, but due to her heavy workload, she can’t access it when she’s at work and pays for a gym instead. Even with Pack Health, she’s had difficulty finding time to talk to her health advisor. Our calls were often interrupted by her running through a drive-thru food establishment just so she could have dinner. Each member’s mental health was impacted differently based on the resources provided and utilized. It’s not uncommon to hear members report they’re stressed. Members like Mrs. E typically report that they are constantly on the go and leave little room for self-prioritization. Mrs. B is experiencing value beyond the job, so the amount of time she is spending isn’t a source of stress in the same way. complete these large solo assignments, Mrs. E found herself thinking in circles and being unproductive. This, in turn, produced more stress during the following workday or around deadlines, pushing her personal mental health and wellbeing further down her priority list. Mrs. B took on an “I get to” attitude towards her workspace. Instead of viewing her early work start times as a chore, she saw it as an opportunity to succeed and thrive with her team. The positive connection to her work caused her to produce better results at the end of the day. Because her company created a culture that benefits employees, Mrs. B experiences a relaxed working environment she’s confident she can succeed in.